Taiwan is a mountainous island. The highest mountain is Jade Mountain, seen here from the north peak. The main peak reaches the height of 3,952 metres (12,966 ft), that is, nearly 4 km (2.5 mi) high. Taiwan is a mountainous island. The island has the largest number and density of high mountains in the world. There are 286 mountain summits over 3,000 metres (9,800 ft) above sea level on the island, with Yushan being the tallest mountain in both Taiwan and East Asia. Mountaineering is one of the most popular activities for many Taiwanese. 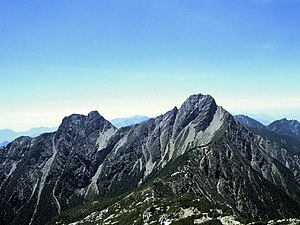 A list of 100 Peaks of Taiwan was created in 1971, which lists the one hundred mountains over 3,000 m for mountaineering on the island. Climbing all of the one hundred mountains listed is considered the greatest challenge for Taiwanese climbers. The rank and locations is the one of the highest peak of each mountain. In total, there are 165 mountains over 3,000 m above sea level, with a total of 275 peaks. Of these 165 mountains, 116 (70%) are located in the Central Mountain Range, 41 (25%) in the Xueshan Range and 8 (5%) in the Yushan Range. Both the Alishan Range and the Hai'an Range (With Data Mountain and Xingang Mountain as the highest mountains respectively) don't feature peaks exceeding 3,000 m above sea level, therefore they are not listed. The " – " means the mountain was already listed in the last list above. Data Mountain 大塔山: 2,663 m (8,737 ft), the highest mountain of Alishan Range, in Alishan, Chiayi. Taiping Mountain 太平山: 1,950 m (6,398 ft), a famous mountain in Datong, Yilan. Xingang Mountain 新港山: 1,682 m (5,518 ft), the highest mountain of Hai'an Range, in Fuli, Hualian. Alishan National Scenic Area: a famous mountain area in Alishan, Chiayi and nearby townships. Yangmingshan National Park: a famous mountain and volcano area in Beitou and Shilin, Taipei City and nearby districts of New Taipei City. Datun Volcano Area (Tatun Volcano Area): a volcano area in Yangmingshan National Park, Beitou and Shilin, Taipei City and nearby districts of New Taipei City. Keelung Volcano Area (Chilung or Jilong Volcano Area): a volcano area in Ruifang and Shuangxi, New Taipei City, near Keelung City. Penghu Volcano Area 澎湖火山區: a volcano area in Penghu. ^ Davidson 1903, p. xxiii. ^ Davidson 1903, p. Index p.9. Davidson, James W. (1903). The Island of Formosa, Past and Present. London and New York: Macmillan. OCLC 1887893. OL 6931635M. * The place names listed above are mainly romanized as Wade–Giles that used in most of academic articles. This page was last edited on 13 January 2019, at 15:07 (UTC).